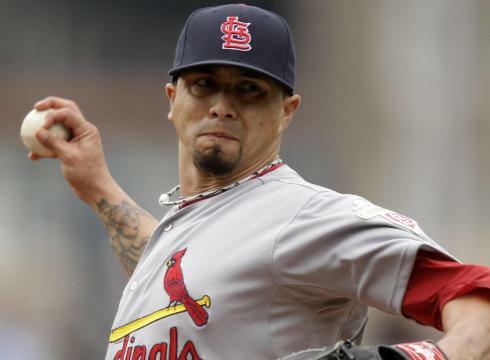 I woke up this morning (or afternoon, depending on if you view noon as “morning”) to the news that the Brewers signed starting pitcher and former Cardinal Kyle Lohse. I hoped I was dreaming, but I knew I really wasn’t. What I had feared for months had come true - with all the decent starting pitchers on the market, the Brewers would settle on the wrong one. Not even 24 hours ago, it seemed set that the Brewers would go into the 2013 season with a youth movement of sorts in the pitching staff, viewing 2013 as a minor rebuilding year. Yovani Gallardo, Marco Estrada, Mike Fiers, Chris Narveson, and prospect Wily Peralta were set to be the rotation, at least while Mark Rogers built up his arm strength on the DL. Now.....Peralta is likely heading back to the minors for a 34-year old pitcher who’s not good. To the casual fan, this seems like a reasonable deal. Lohse is coming off a career year in St. Louis where he put up a 16-3 record in an impressive 211 innings with a shiny 2.86 ERA. He rarely walked hitters or gave up home runs. On the surface, a 3-year, $33 million-dollar deal for such a pitcher seems like a steal. But there’s so much more than what meets the eye. Let me explain. As I mentioned earlier, Lohse pitched for the Cardinals not only last year, but for the last five seasons. Three of those years were solid or good, two of those seasons were awful. Prior to his Cardinals career, he was pretty much just awful. The Cardinals have a history of finding value in scrap-heap pitchers (Chris Carpenter, Todd Wellemeyer, Joel Piniero, Braden Looper, etc.) and Lohse was no different. But I’m not willing to say he’s just a new pitcher and will continue his success in Milwaukee. First, he’s 34. Signing old pitchers is not good business, as Brewers fans surely should be aware of. Second, he’s pitched the last few seasons in a pitcher-friendly ballpark that suppresses home runs. That last part is important because he’s a flyball pitcher that doesn’t strike many hitters out. Miller Park is very homer-friendly and as a result more of those fly balls that Lohse induces are likely heading over the fence. Third, advanced stats suggest that Lohse got a little lucky the last two years, with batted balls turning into outs at a higher-than-normal rate as well as a high number of baserunners stranded. While it’s possible he has some kind of skill in those areas that we don’t know about, if those numbers regress to the mean, you’re looking at a very ordinary pitcher at best. Even if he outperforms his peripherals, he’s stuck in a park that doesn’t match his skills. The likelihood of Lohse outperforming Peralta (who’s waaaaay cheaper) this season seems low, and the gained service time from Peralta starting in the minors pales to the ultimate price the Brewers are paying. Not only is it a high monetary price tag, but the Brewers have to give up their first round pick to sign Lohse (meaning the rival Cardinals get an extra pick), since he’s a type-A free agent. That is a heavy cost for a team with a weak farm system, especially one that’s only on the periphery of a playoff race, not entrenched in it. The knee-jerk reaction may be to blame General Manager Doug Melvin, but it’s entirely likely he had no part in this. Owner Mark Attanasio had been in contact with Lohse’s agent, Scott Boras, and the possibility loomed that Attanasio would bypass Melvin (who didn’t want to give up the draft pick) to sign Lohse. This especially seems odd considering Attanasio just signed Melvin to an extension last year, and now Mark is basically undermining his General Manager to sign a player who’s not worth the price they’re paying. But Attanasio values winning at all costs, even though I doubt Lohse will contribute the wins the Brewers require of him. All in all, Lohse will probably be okay, an average starter that eats innings but can’t put them over the top. Which is fine for most teams, but not for a team like the Brewers that’s trying to limit payroll and develop young pitchers. It’s another frustrating move from an increasingly frustrating organization. At least Melvin can’t be fired if this move goes badly....I hope.